Come see Mickey and the gang @ ''Minnie'' prices!!! 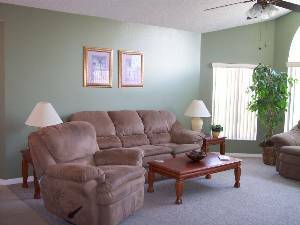 Our condo is an upper one level unit with cathedral ceilings and it has a very open feel. 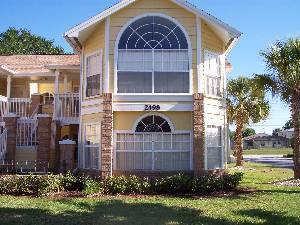 We are just a few steps from the pool, clubhouse, tennis courts and volleyball. My husband and I took our grandchildren to Disney and we stayed at John and Sharon Vignoes condo. Let me tell you, we didn't want to leave, it was so much like home and this is a place you can call home. Off the beaten path just enough to have it quiet, yet so convenient. We plan on returning again soon and really looking forward to it. Thanks John and Sharon,your hard work has paid off. in Orlando, Florida. Also I would like to add John was awesome to deal with and he is a man of his words. Great place to stay! We loved it! We stayed from 11/22 to 11/28/09. Great location! Close to the parks. Well appointed with amenities that most Condo Rentals don't think about. For those flying to Orlando, the Condo has umbrella strollers and play pens for the little ones. We didn't use either of them, but it was nice to see. John was great to deal with and even called to see if we needed anything. This will definitely be our new Disney home when we come back to see Mickey!!! Plenty of room for 8! Just a great place to stay! I can't say enough! Thank you so much! We loved staying here! The property is beautiful, clean and had all the amenities we could possibly need.The kids had a blast. It was very convenient to everything we wanted to do and see. When we took a day to slow down, we had a great time at the local miniature golf course and then swimming in the very nice pool located at the rental property. John Vignone was very helpful and always very prompt with any questions we had before we arrived and VERY accommodating during our stay. Our stay was from August 22nd- 27th 2009. We will definitely be staying here any time we come to Florida. We thoroughly enjoyed staying at your Sweetwater condo. There was plenty of room for all of us! The location can't be beat. So very close to the parks, restaurants, stores and other attractions. We will check back with you when we are able to return to Florida. Thanks again. This place is great. We felt like we were home. We had no problems, John was a pleasure to work with he delt very kindly with us and treated us like family. We will definatly be coming back and making this our place to stay everytime we are in kissimme. Thanks so much the the vigones we had a great time and we look forward to furhter communications with you. We had the privilege of staying in Mr. Vignone's condo in August, 2007. Could not have asked for a better place to stay - convenient to restaurants - shopping centers - and very assessible to Hwy. 192 (going to Mickey's place) and Hwy. 4 (Universal, Sea World and Daytona Beach). The Condo was very clean and spacious - we had 6 people in our party and everyone had a wonderful time - a great place to relax and unwind after a long day with Mickey!!! Will most definitely stay here on our next trip to Orlando!!! Thanks, Mr. & Mrs. Vignone for sharing your home with us. We just got back from the very best vacation I have ever had at Walt Disney World. It was early September – the weather was perfect and the crowds were minimal. This condo was wonderful!! 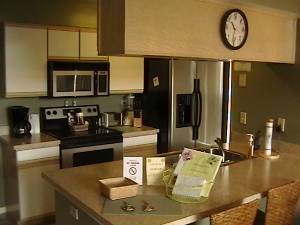 The accommodations were immaculately clean and the condo was very spacious. We were only 10 minutes from the park, but it was soooo nice to leave the hustle and get to the condo in the evening so we could “sprawl” out and relax. The pool area was very clean – and it includes a work out area that my husband really enjoyed! It was our pleasure to stay at this condo in July of 2007. We were very pleased with the spacious accommodations and the attention to detail. 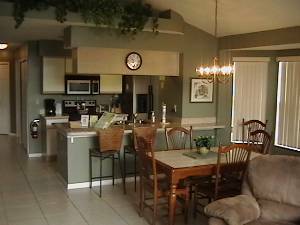 The condo is in an excellent location with easy access to Hwy 192 (the straight shot into the Disney complex) and near numerous activities, eating places and shopping centers. The large shower in the master bedroom is particularly nice. This is an excellent value at an excellent location. Folks, I want to tell you, John Vignone is a straight shooter, this place was just as advertised, no.....better...much better. John went to great lengths to accommodate us, he called to make sure we were happy, it couldn't have been nicer or easier to accomplish. If you're considering Orlando and a condo, I guarantee you without hesitation that you'll leave satisfied. We did. This condo and it's oweners are 5 star-PLUS quality!!!! John and Sharon have made their home become your vacation dream home!!! Comfortable very very clean, in close proxcimity to all points of intrest!!! It is a superior vacation spot!!! My family and I will NO longer stay anywhere else when we visit Florida!!!!! When we were stranded, due to BAD weather we got in touch with John(in CT.) and he worked magic!!! Without a bat of an eye his kindness kicked in. Working with the great management and SUPER cleaning staff my family was no longer stranded!!! (although can you really call this paradise stranded???) We were in another condo by morning of the next day!!! Everyone there just pitched in to make us feel safe and comfortable!!! You don't find that much, now a days...personal contact genuine kindness and superior customer service, I thought it was a lost art until I met with the Vignone Family!!! Heartfelt Thanks John and Sharon. We hope to return time and time and time again!!!! When our parents first rented John and Sharon's condo, we wondered what we would find. NOW the entire family thinks of the condo as OUR vacation home!! It is spacious, comfortable, welcoming, and convenient. John and Sharon are very attentive to details and really want you to feel at home. Now when the word "vacation" is mentioned, we all start packing for our stay at "The Condo"!! The owners of the condo are two of the nicest people I've encountered, especially while traveling. Their customer service is top notch. Although we've never met them, they treated us as if we are their family.That alone is invaluable. The condo is located in the perfect location. 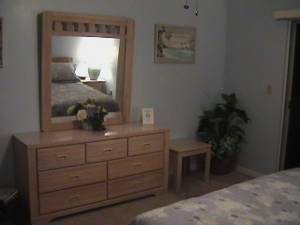 It's in a quiet area yet only a few miles from ideal shopping for all your needs. 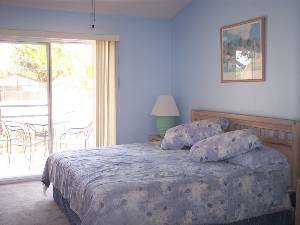 The major attractions are also a short drive away. The condo is nicely decorated, well maintained and very clean. The daily and weekly rates are MORE than reasonable. You're certain to have a great experience here.We highly recommend it! This is a great condo, very comfortable, nicely furnished and convenient to everything. The Vignoneâ€™s really make you feel at home in their beautiful condo. We are looking forward to returning here next year. Apartment very comfortable,nicely furnished and convenient. The area is ideal to benefit from the well publicised fun parks, golf courses and choice of restaurants. One can also enjoy the site pool, well heated and pleasant by it,s surroundings. All in all a really good holiday easily arranged with Mr Vignone and we are pretty certain to contact again. ***** (five stars)This is a great condo for several reasons. It is very clean, very comfortable and very affordable. The owner was friendly and answered all of our questions. 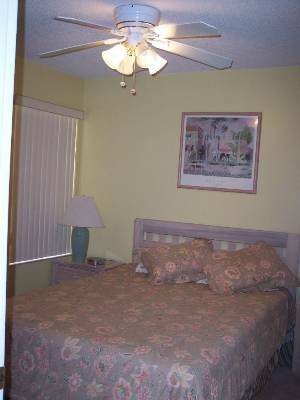 The condo is about 5-10 minutes from Disney, an easy drive. We stayed Dec 31st until Jan 4th and the neighborhood was very quiet. It was a lot roomier than we thought it was going to be, plenty of space for our 2 children to play. We have stayed in many "home away from homes" and this condo has been the best by far. Our stay at this property was excellent. Our kids had a wonderful time. We are planning to come back next year. As repeat guests at John and Sharon's condo, we can truly say it is a vacation HOME. 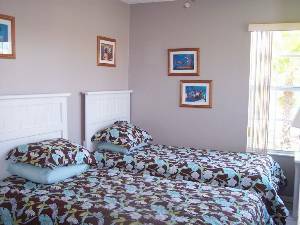 They have provided an inviting and well maintained place and want their guests to enjoy staying there. We have been so happy staying there we are returning for our third time this year! It is an ideal location for adults and children and we look forward to future visits. Repeat guests will receive a 10% discount on all future vacation packages. Other Fees: Cleaning fee is for rentals of (5) five nights or less.